Nantahala River Lodge is located in the Upper Nantahala Gorge – centrally located between Franklin, Bryson City, Andrews and Robbinsville. The Lodge is about 80 miles SW of Asheville, 80 miles SE of Knoxville and about 160 miles North of Atlanta. The Lodge sits on two level acres with 1400 feet of frontage on the Nantahala River. No other homes are visible from the Lodge. There are no steep inclines. It is within walking distance of the Nantahala River launch site, the Nantahala River bicycle path and the Bartram Trail. 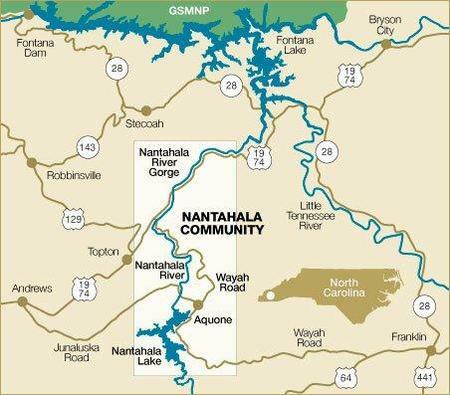 The Nantahala Outdoor Center is about 7 miles from the Lodge. There are several great restaurants nearby. The Nantahala Gorge features sheer rock walls that soar for hundreds of feet above the river. The Lodge is just off Wayah Road / SR 1310 which is a part of the Mountain Waters Scenic Byway. The byway winds past numerous waterfalls just minutes from the Lodge. Runway: 5500 x 100 ft.
Take I-40 West to Exit 27 (the Great Smoky Mountains Expressway). Continue West on US 74 past Waynesville, Sylva, Dillsboro and Bryson City. After you pass Exit 64 go about 6-7 miles and be on the lookout for the road to split. You want to go left towards the Gorge and Andrews. (When you see signs for Hwy 28 North – Fontana, make sure you are in the left hand lane) Go about 12 miles and turn left onto Wayah Road. Take I-75 North to I-575 North, which becomes Georgia route 5. Go through Blue Ridge, GA, turn left (West) on to Route 60 and travel 1.5 miles to Mineral Bluff, GA. Turn right on to Route “60 Spur” and travel approximately 12 miles to the junction with US 19/74. Turn right (East) and proceed on US 19/74 through Murphy, NC and Andrews, NC. The road will become a two lane road after Andrews. Go about 9-10 miles and turn right onto Wayah Road. Take I-85 North to I-985, which becomes US 23, which becomes US 23/441. You’ll pass through Clayton, GA, Franklin, NC, and Dillsboro. Just past Dillsboro, take US 74 (the Great Smoky Mountains Expressway). You will pass the exits for Bryson City. After you pass Exit 64 go about 6-7 miles and look for the road to split. You want to go left towards the Gorge and Andrews. (When you see signs for Hwy 28 North – Fontana, make sure you are in the left hand lane) Go about 12 miles and turn left onto Wayah Road. Take I-85 west to US 74. Continue west on US 74 to I-26. Go north on I-26 to I-40. Take I-40 west to Exit 27 (US 74, the Great Smoky Mountains Expressway). Continue West on US 74 past Waynesville, Sylva, Dillsboro and Bryson City. After you pass Exit 64 go about 6-7 miles and be on the lookout for the road to split. You want to go left towards the Gorge and Andrews. (When you see signs for Hwy 28 North – Fontana, make sure you are in the left hand lane) Go about 12 miles and turn left onto Wayah Road.